One can't help but notice a recent increase in fashion events across the world which encourage designers to create outfits from otherwise trash or pre-loved material. 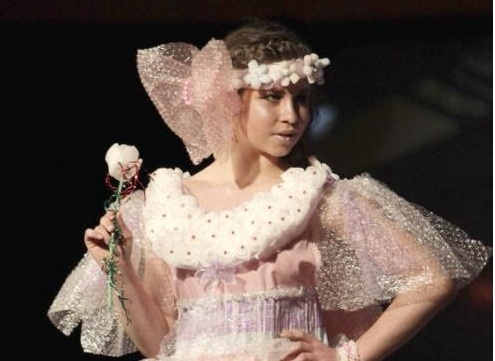 I discovered Junk Kouture today, a recycled fashion contest in Northern Ireland, which challenges budding eco-fashion designers by inviting secondary school students to fashion discarded materials, and redesign them into couture fashion for men and women. 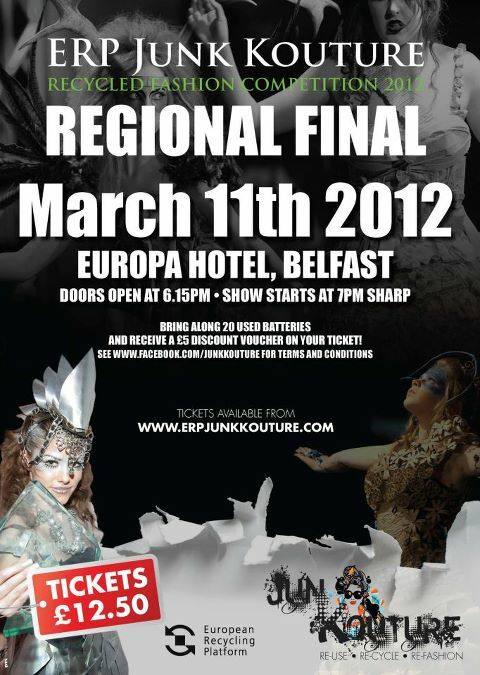 Junk Kouture, sponsored by The European Recycling Platform (ERP) will host three regional finals, in their second all-Ireland recycled fashion contest. The Europa Hotel, Belfast on the 11th March 2012 at 7pm, Hodson Bay Hotel, Athlone on 25th March 2012 and The Strand Hotel, Limerick on 1st April 2012. The finals will then take place on April 20th in City West Hotel, Dublin, and will be televised on the Late Late Show. Online voting starts tomorrow for the northern regional finals, so you can have a nose on the site to see what dresses will appear on stage. I have located a youtube video of 2011's event here, would anyone care to translate? Retail receipt dresses, crayon headbands, crisp (chip) packet dresses, and bubble wrap hair pieces, the creativity of Junk Kouture's contestants is really quite inspiring, particularly considering they are of high school age. I shall be checking out Junk Kouture's facebook page for more updates in the coming weeks too. So cool, I love the dress made of receipts! Lots of talent here, for such young people! what a great initiative. Takes lots of talent and creativity! I made it from plastic bottles and jeans. inspired by claude monet.